When the Irish famine ships arrived in Boston in the 1840s, tens if not hundreds of thousands of immigrants from Ireland already made their mark on New England. By 1790, there were 400,000 Americans of Irish birth or ancestry out of a population of 3.9 million. Half were Scots-Irish from Ulster, the other half were Catholics from southern Ireland. Before the American Revolution, the Irish population in America was second only to the English, with 70 Irish settlements in the British colonies. It is far more difficult to find information about the Irish Catholics of colonial New England than about the Scots-Irish. Puritans persecuted Catholics, while they more or less tolerated the Scots-Irish. But so absent were Irish Catholics from the historical record that some historians – and a Scots-Irish society – claim few Irish Catholics lived in New England before the Revolutionary War. It isn’t so. Protestant and Catholic immigrants from Ireland taught the Puritan children, settled the Maine and New Hampshire frontiers, built roads, wharves and warehouses, led armies and became successful merchants. Eight of the 56 signers of the Declaration of Independence had Irish birth or ancestry, as did seven of the 54 framers of the Constitution. They governed states, wrote laws and fought in the Revolution. The first great migration to New England began in 1628, when King Charles granted a new charter to the Massachusetts Bay Colony. Between 1629 and 1640, 20,000 people crossed the Atlantic. They weren’t all Puritans. Immigration fever had caught hold of Anglicans, Irish Catholics and Scots-Irish Protestants. They came to escape religious persecution, high rents, crop failures and poverty. The Puritans in charge scrutinized the new arrivals. ‘Persons unmeete to inhabit here’ were sent back over the Atlantic. And since the Puritans wrote history from their own intolerant viewpoint, the Anglican and Irish experience of that era is less well – and less accurately – known. In 1640 the great migration ended with the outbreak of the English Civil War, and some of the Massachusetts Bay colonists returned to England to fight with the Parliamentarians. New England fell into an economic depression, and the first wave of immigration ended for at least a decade. By 1650, a steady stream of Boston-bound ships began to leave Ireland filled with redemptioners – indentured servants who agreed to near-slavery for seven years in exchange for passage, food, shelter and clothing. That stream would become a flood. King James I had encouraged Scottish Protestants to move to Ulster in the 16th century as a cure for overpopulation and to discourage further rebellion. They lived there for generations, where they clashed with the Catholics, but prospered from the manufacture of textiles. Then in 1698 the English government banned the export of wool, destroying the Ulster wool industry. Crop failures inspired an exodus. The first major migration of Scots-Irish to America was a group that came with Rev. James McGregor from County Londonderry to Boston in 1718. Many of them moved to New Hampshire, establishing the town of Londonderry. The Puritans accepted the Scots-Irish because of their Protestant religion and because they arrived in organized groups, often led by clergy. Plus, they were useful as pioneers in the forests of New Hampshire and along the Kennebec and Eastern rivers in Maine. There they acted as buffers from Indians. As individuals, though, the Scots-Irish didn't always receive a welcome. Their Presbyterian meetinghouse was burned in Worcester, an early harbinger of Know Nothingism. The Puritans treated Irish Catholics even worse. They wouldn’t let people own property or carry on a business in Boston unless they took the Oath of Allegiance to some Protestant faith. From the 1740s to the 1760s, rival gangs fought on Nov. 5 over the right to burn the Catholic pope in effigy, Pope Night. The Catholics kept out of the Puritans’ way and they stayed out of the historical record. Historian Michael O’Brien argues that many Irish Catholics abandoned their faith and became Baptists and Methodists. “There was no alternative for them,” he concluded. In 1678, the men who took the Oath of Allegiance before the Massachusetts governor had such Irish Catholic names as Murphy, Dempsey, Casey, O’Kelly, Hearn and Collins. Many of the Irish Catholics came as indentured servants. They sailed from Dublin, Cork and Waterford to Marblehead, Boston, Providence and Piscataqua, Maine. Some came from Galway via Newfoundland, where they fished. Some came by way of Barbados, where Oliver Cromwell had deported 50,000 Irish Catholic peasants as indentured servants in the mid 17th century. Ann Glover was one. 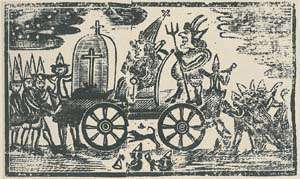 She was living in Boston by 1680 and hanged on Nov. 16, 1688 as a witch. The proof: she could only say the Lord’s Prayer in Gaelic. Another indentured servant from Ireland was Matthew Lyon, born in Dublin on July 14, 1749.. He emigrated to Woodbury, Conn., in 1764, and he fought in the Revolution. Afterward he was elected to Congress, where he started the first brawl. Records show early 18th century soldiers and schoolmasters named Kelly, Sullivan, Fitzgerald, Hickey, Murphy, Mooney, Maloney, Lynch and Reilly. And there are plenty of New England towns with Irish Catholic place names, suggesting the Scots-Irish weren’t the only hardy pioneers. There’s Kilkenny, N.H.; the lost town of Cork, Maine; Dublin, N.H., and Dublin, Maine; and three Waterfords – in Maine, Vermont and Connecticut. With no love of the English, Irish immigrants and their descendants played major roles in achieving American independence. 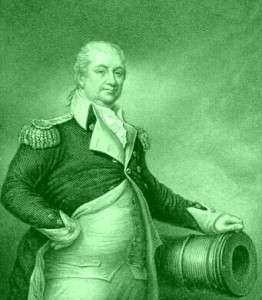 John Hancock was Scots-Irish; so was George Washington’s trusted adviser, Gen. Henry Knox. A signer of the Declaration of Independence, Matthew Thornton, came from non-Ulster Ireland – in Limerick – though he lived in Londonderry, N.H.
More than 1,200 officers in the American armies came from Ireland, including Gen. John Sullivan, later a New Hampshire governor. And the muster roles of the Continental Army and Navy are filled with Hibernian names. There are 695 Kellys alone who fought against the British. The Continental Army also celebrated St. Patrick’s Day in 1778 at Valley Forge. According to an account of the incident, some of the Pennsylvania German volunteers made a stuffed scarecrow they called a 'paddy' and hoisted it on a pole. It attracted a crowd of angry Irish soldiers, who threatened a riot. Their officers couldn't restore discipline. Then George Washington arrived on horseback and tried to calm the outraged Irishmen. Finally he said, "I, too, am a lover of St. Patrick's day, and will settle the affair by making all the army keep the day." He then ordered a whiskey ration to every man in camp, and the soldiers long remembered the day as a pleasant episode in camp life. This story was updated in 2018. Yes, he was, but at that time it was a sign of prosperity. Had a great dinner of corned beef and cabbage last night to celebrate St. Patrick’s Day!! 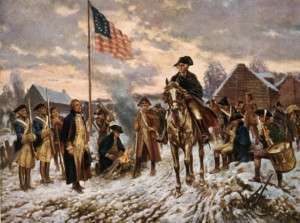 Very interesting – but isn’t the spring of 1778 in Valley Forge when 2,000 soldiers died in camp of “Camp fever” and were buried in unmarked graves – it would be at same time as this article talks about. My 7th great grandfather died in camp of “camp fever”/ So many thousands died, Washington did not want the enemy to learn of it, hence the mass graves unmarked. This looks nothing like Washington. Bad painter, his arms are way too short for a really tall man. ^Pat Epp, it’s actually Henry Knox. His arms do look a little short, though. Henry Knox – we have a monument to him on Rt 20 in Wilbraham and Palmer – where he passed thru on Old Boston Post Road.